These all-vinyl mini treasures make perfect gifts! They are so cute and fit in your hand. This is the anatomically correct real girl with pink blanket variety. They come in an assortment of outfits and ethnicities, to make it easy to find the perfect one for you. The Specialty Play Doll Collection is made up of a wonderful range of dolls that are an amazing mix of quality, design and playability. This collection is perfect for doll enthusiasts that want a lot from their play dolls. They are available in a variety of three different expressions which are selected at random. In stock and ready to ship! 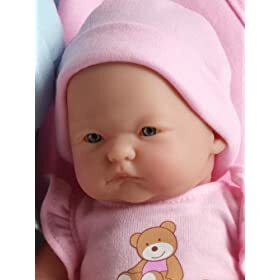 Corolle Mon Premier Calin Charming Pastel is the perfect “my first baby” doll. 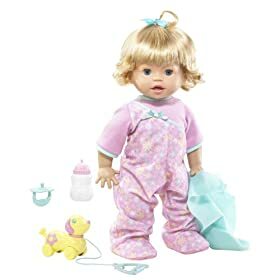 A soft bean filled body allows this doll to posed and played with like a real baby. The vinyl limbs and face are supple and have a mild vanilla scent that children love. The eyes open and close, so it can take a nap just like a real baby! 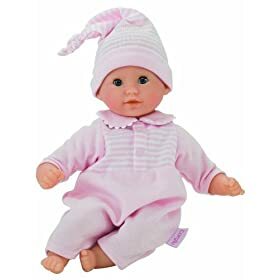 This lightweight doll is fun to carry around, hug, and snuggle. Adorable and durable, this doll can stand up to the roughest play. Arabesque, anyone? Les Chiries? Chloe Ballerina is recital-ready in a leotard, tutu, tights and pink slippers with ribbon laces. She has an all-vinyl body, moving eyes and long rooted hair that can be worn down or styled up – it can even be shampooed! Blue eyes. Doll measures 13″ tall.